2360 Longview Drive is located in the west area of Bishop, off of Barlow Lane. This friendly neighborhood is just outside the city limits, and you will often see your neighbors out walking with their families and pets. Property details for 2360 Longview Drive, Bishop California. 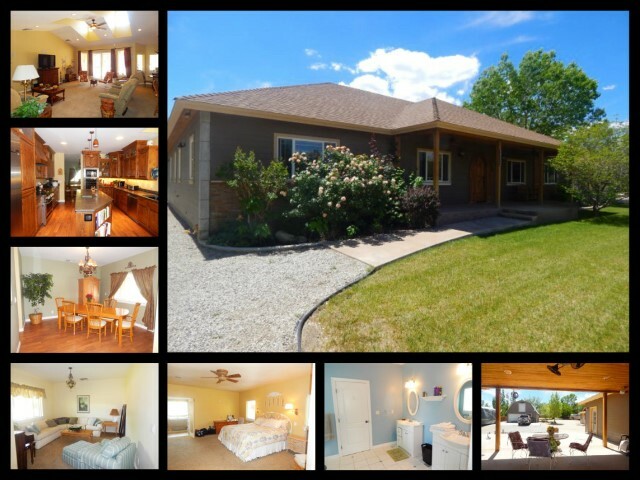 This home is a sprawling single story ranch style home with a split floor plan. It has a fantastic cooks kitchen with generous amounts of cabinets and storage. The kitchen also offers stainless steal appliances and concrete counter tops. The living room has vaulted ceilings and a sliding glass door that leads out to a covered patio and entertaining area. The home also offers a formal dining room and den. The west wing consists of 2 spacious bedrooms with a Jack and Jill bathroom; as well as a second master bedroom or guest suite. The home sits 0.71 acre, and zoned for horses. Behind the home there is a detached 1 car garage and a freestanding workshop building. At the back of the property there is a tranquil seasonal creek that is visited by ducks and other flying wildlife. Trees are located around the property that offers shade and beauty.